The "diamond ring" effect just after totality ends, and the moon moves on. 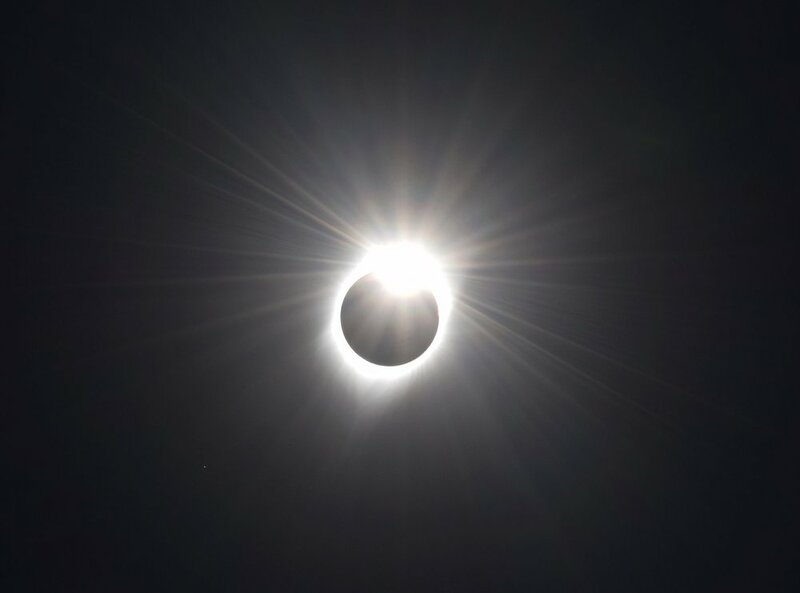 As some of you may know, I recently traveled to Wyoming to see the total solar eclipse across the US on August 21 (watched by an estimated 20 million people). Since I currently live in New Zealand, this was a bit of an ordeal: flying up to Auckland, running between the domestic and international terminals, spending the night on a 13 hour flight to San Francisco, going through immigration and customs, and then continuing on to Salt Lake City to meet up with my family – and then doing all of that in reverse two weeks later. But it was 100% worth it. If I had only seen the eclipse and nothing else, it still would’ve been worth it, because that was one of the most incredible things I’ve ever experienced. But luckily, I did get to see more than the eclipse – a lot more. We rented a campervan in Salt Lake City, and then drove north into Wyoming (via the Uinta Mountains) to find a nice flat, clear spot to watch the moon pass in front of the sun, which involved a lot of driving back and forth through a whole lot of nothing in the middle of nowhere. But once we found our eclipse-watching spot on a dirt road on some open ranch land near Casper, I started to notice that even this flat, empty-looking nothing land was actually full of life! Cacti and other desert plants, all kinds of insects, pronghorn antelope, rattlesnakes and lizards, birds, all sorts of things. Unfortunately I don’t have too many photos of that spot, since I was taking pictures of the sun and moon almost the whole time. Then after the eclipse, we went north into the Bighorn Mountains, and then on to Yellowstone National Park via the Chief Joseph Highway. I’ve been to Yellowstone twice before: once when I was about three months old (my first word was “elk”), and then again when I was 16, but had “the worst case of mono I’ve ever seen” according to the doctor we saw in Montana, and so I slept through a lot of it. So this time, I was really determined to have a great time, see lots of cool things, do some hiking, and actually remember it. And boy, did Yellowstone deliver! Those little white blobs are mountain goats! We entered the park from the northeast, early in the morning on August 23. This way, we would drive through the Lamar Valley, one of the best places in Yellowstone to see wildlife. Before we got into the wide open valley though, we stopped at a pullout where there was a single buffalo lying in the grass and some wrinkly mountains off to the north. Upon closer inspection, the mountains turned out to have families of bighorn sheep picking their way from boulder to boulder. We watched them for a while (giving the bison plenty of space) until they disappeared into a crevice. Then we drove on until we were out of the forest. We were moving slow, scanning the meadows carefully for wildlife with binoculars, but as it turned out, we didn’t need to. The wolf is the dark speck on the left, and the bear is the one on the right. Unfortunately, I only have a 200mm lens and they were around a kilometer away. We encountered a major traffic jam, caused by people trying to park by the side of a narrow road with almost no shoulders so they could get out and check out an animal. Upon asking, we found out that there was a grizzly bear across the valley, and that wolves had been seen earlier a little farther up the road. We parked haphazardly and joined the crowd on the ridge. The bear shuffled along for a ways, then sat down on its haunches. After maybe ten minutes, a smaller shape approached it – a wolf. I had read all about how wolves were eliminated from Yellowstone and then reintroduced, but this was the first wolf I’d ever actually seen, and I was thrilled. The bear wasn’t though; it got up again and walked back the other direction as the wolf pranced around it. Eventually the bear got sufficiently annoyed with the wolf that it took a swipe (which didn’t connect), and the wolf left it alone after that. An elk cow munches on water plants near Canyon Village in Yellowstone. Eventually the bear retreated into the woods on the far side of the valley, and wolf was joined by a fellow pack member and they both disappeared into the hills. Only then did we move on towards Canyon Village, where we stayed for the next few nights. We visited some of the geothermal features in the afternoon, which were amazing, but I was always on the lookout for wildlife. I got excited about just about every animal, but not everyone did. I remember stopping to watch some elk that first evening, and a couple of girls around my age (20s) came up to us to ask what we were looking at. When we told them about the elk, one made a face while the other said in a snarky tone, “Oh. We’re looking for bears.” They went back to their car without a second glance. I had to bite my tongue so I wouldn’t say something regrettable. This ermine may be cute, but they're vicious predators. They manage populations of small herbivores in the American West. We saw quite a lot of wildlife in Yellowstone over the next few days. We returned to the Lamar Valley and saw a few more wolves and a coyote, but no more grizzly bears. We caught a glimpse of a black bear driving over the Dunraven Pass, but it wasn’t safe to stop and look properly. There were elk and bison and chipmunks all over the place, and birds of all sorts: sandhill cranes, peregrine falcons, ospreys (which I previously thought only lived near the ocean). While hiking on the Mt. Washburn trail, we caught a glimpse of a yellow-bellied marmot near the top, and saw an ermine (a kind of weasel) on the way back down. The ermine was a bit of a shock – living in New Zealand, I’ve been conditioned to hate mustelids like weasels and stoats because here, they’re invasive predators that kill endemic birds. But that weasel was exactly where it belonged, and was an important part of the local ecosystem. The Cascade Canyon hike in Grand Teton National Park is spectactular. This bull moose in Cascade Canyon wasn't bothered by us in the slightest. After Yellowstone, we went south into Grand Teton National Park, where we did possibly my favorite hike of all time – Cascade Canyon. To access the canyon, you either have to take a boat across Jenny Lake, or walk two or three miles around the lake shore. Then you’d normally climb up to Inspiration Point to into the canyon itself, but they were doing trail work and we had to go the long way around. That’s okay though – the long way was gorgeous, wending through dense forest with sunlight falling through the leaves overhead. Once we got up into Cascade Canyon, there were far fewer trees and we were able to see the incredible mountains around us. At one point, we came across an enormous bull moose lying on a grassy bank next to the creek. Every so often he’d swing his head around and nibble on the bushes (I learned later that bull moose do a lot of bulking up and resting in late summer and fall to prepare for the rut). He was just magnificent. He was still there when we were on our way down that afternoon. There were a lot more people hanging around watching him by then, but he wasn’t fazed at all; he just yawned and kept munching leaves. We also saw loads of birds and ground squirrels up there, and it’s bear country, but we didn’t see or hear about any. When we were on our way back towards Salt Lake City, we drove back through a lot of “nothing” – although we knew better. It was sort of shocking to be back in a city, and then dealing with all the logistics of traveling back to New Zealand. But I have my pictures. I photographed constantly, and now I have beautiful reminders of the amazing things I saw and experienced. I’ve finally seen wolves, and I now have a Yellowstone/Tetons experience that I can actually remember. I learned all sorts of new things. Oh, I got to watch the moon pass in front of the sun too.